Many gold-analysts seem to be seeing positive technical signals in gold and the miners as prices move above 50 and 200 day averages, though plenty expect a retest. Larry Edelson is sticking with the models and cycles which kept him out since 2011. He sees new lows into May-14 and then very high prices to come. Meanwhile Jordan Roy Byrne looks to previous markets which advanced from historic lows into the wall of worry with only limited pullbacks. But of course this means believing that the bottom has passed. Edelson's desperate final plunge looks to fit with some of the historic patterns Byrne plots. Some suggest there is chasing in the short term, Geoff Goetz at Bill Cara's blog has called the recent advance very well. 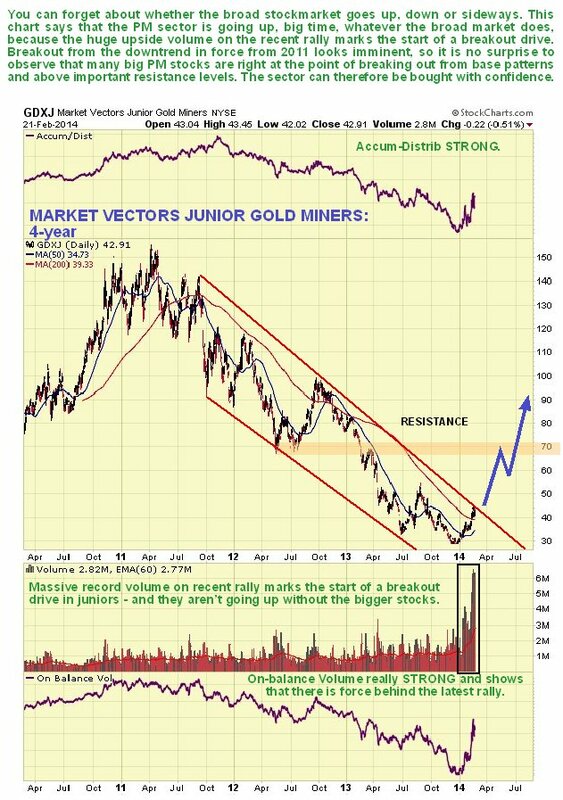 Clive Maund is seen as a contrary indicator by some, is the volume he points to in the GDXJ definitive? Have a watchlist which ranks your miner holdings by value. If you have stuck around during the bear the biggest are likely the stronger companies. How far have they bounced from the 52 week lows? How close are they to advancing into 52 week highs? The stronger stocks are close meaning they have likely moved past the April-13 breakdown point, what do those stocks have? Look at the left sidebar of this blog: "Companies" watchlists are here to review relative performances across the ETF holdings, venture index companies and more. See the tax losses to take, companies you thought you owned but who rolled you back to tiny share-holdings, if you think you own them you don't any more, you were rolled out. Forget where-ever you have come from and delete the mental anchoring of the price you paid, you may not go back there. Look at the progress against a new starting point. Why aren't they moving up? Is the highest proportion of your portfolio where it needs to be? Put in those mental stops you wish you had at the end of 2010. If Byrne is right and there should be no more than a 15-21% pull-back put in those mental stops on your new re-based watchlist so you can choose to buy at Edelson's next panic bottom.